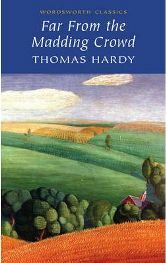 Thomas Hardy’s Far from the Madding Crowd, the most pastoral and famous of his Wessex novels, was first published in 1874. The story concerns the elusive, beautiful and wayward young Bathsheba Everdene and the various men who develop a romantic interest in her over the course of the novel. Bathsheba arrives in the country to live with her aunt, Mrs Hurst, at the start of the book and soon attracts the attentions of local shepherd Gabriel Oak, who surprises Bathsheba by proposing marriage. ‘His Christian name was Gabriel, and on working days he was a young man of sound judgment, easy motions, proper dress, and general good character,’ writes Hardy. ‘On Sundays he was a man of misty views, rather given to postponing, and hampered by his best clothes and umbrella: upon the whole, one who felt himself to occupy morally that vast middle space of Laodicean neutrality which lay between the Communion people and the drunken section. Oak’s offer of marriage is gently rejected (she advises him to find someone rich to marry) by the independent and thoroughly modern Bathsheba – who then moves away to the village of Weatherbury. Their paths are destined to cross again though when Gabriel loses his prized flock of sheep in an accident and is forced to travel around the area looking for some work to make ends meet. After he stumbles across a fire at a farm and helps to put it out, he decides to ask the owner of the land for work. The veiled owner turns out to be Bathsheba – having recently inherited the estate from her late Uncle. Bathsheba, despite an initial awkwardness at meeting him again, allows Gabriel to work as her shepherd on the land and he soon becomes her faithful friend and an invaluable employee with his knowledge of the countryside. As Gabriel, who still has strong feelings for Bathsheba, bides his time, she inadvertently attracts the attentions of the reclusive Farmer Boldwood after a childish Valentine prank backfires. His love for Bathsheba fills Boldwood with ‘a fearful sense of exposure’ and he too proposes marriage. Adding to the complications even further are expert swordsman and all round rakish rogue, the handsome and dashing Sergeant Francis Troy, who Bathsheba herself becomes smitten with after a chance encounter one night. Far from the Madding Crowd, a charming rural idyll, becomes increasingly engrossing as we follow the knotty personal life and ups and downs of Bathsheba Everdene and the three very different men who all attempt to win her for themselves. Possibly, Far from the Madding Crowd takes a few pages to get into fully but for me this book is like The Moonstone in that once you get into it you can’t put it down. Bathsheba is an appealingly vivid character and is given a memorable entrance into the book, admiring herself in a looking-glass on a carriage as Gabriel looks on. ‘What Possessed her to indulge in such a performance in the sight of the sparrows, blackbirds, and unperceived farmer who were alone its spectators, – whether the smile began as a factitious one, to test her capacity in that art, – nobody knows; it ended certainly in a real smile. She blushed at herself, and seeing her reflection blush, blushed the more.’ Bathsheba’s beauty and independent nature soon stirs up local interest and a vague – sometimes unrequited – love triangle (or even quadrilateral) ensues. Each of Bathsheba’s potential suitors has their distinct strengths and the sweep of the story always makes you curious to see what will happen. Boldwood offers money and security, Oak has good character and kindness, and the dashing and caddish Troy is exciting. ‘IDIOSYNCRASY and vicissitude,’ writes Hardy. ‘Had combined to stamp Sergeant Troy as an exceptional being. He was a man to whom memories were an encumbrance, and anticipations a superfluity. Simply feeling, considering, and caring for what was before his eyes, he was vulnerable only in the present. His outlook upon time was as a transient flash of the eye now and then: that projection of consciousness into days gone by and to come, which makes the past a synonym for the pathetic and the future a word for circumspection, was foreign to Troy. With him the past was yesterday; the future, to-morrow; never, the day after.’ You do find yourself hoping for a particular outcome which adds to the readability of the book a great deal. There might be a tad too much farming detail in Far from the Madding Crowd for some tastes but these elements do add greatly to the overall atmosphere of the story and Hardy’s descriptions of nature, ancient rural traditions, stars in the night sky and the countryside in general are always enjoyable. ‘The fields and sky were so much of one colour by the snow, that it was difficult in a hasty glance to tell whereabouts the horizon occurred; and in general there was here, too, that before-mentioned preternatural inversion of light and shade which attends the prospect when the garish brightness commonly in the sky is found on the earth, and the shades of earth are in the sky. Over the west hung the wasting moon, now dull and greenish-yellow, like tarnished brass.’ Hardy’s almost nostalgic feelings for the countryside and its ways are a major theme of the novel although the main absorbing appeal of the book lies in the great characters and their intertwining relationships and interactions. Far from the Madding Crowd is a compelling and classic story with the majestic backdrop of Hardy’s Wessex countryside in all its glory and different moods. No Comments on "Far from the Madding Crowd"